Lexmark Return Programme Imaging Units are patented devices that are sold at a special price subject to the restriction that the imaging unit may be used only once. Following the initial use, the customer agrees to return the imaging unit only to Lexmark for remanufacture and/or recycling. The Return Programme imaging units are designed to stop working once they reach their respective rated life (as established by Lexmark). In addition, the imaging units are designed to automatically update the memory in the customer’s printer to protect against the introduction of counterfeit and/or unauthorised third-party cartridges. 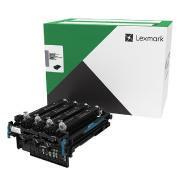 If the customer does not accept these terms, replacement imaging units sold without these terms are available at www.lexmark.com. Black, Cyan, Magenta and Yellow developer units and photoconductor units.